Susan’s musical touch was one of the highlights of our day. 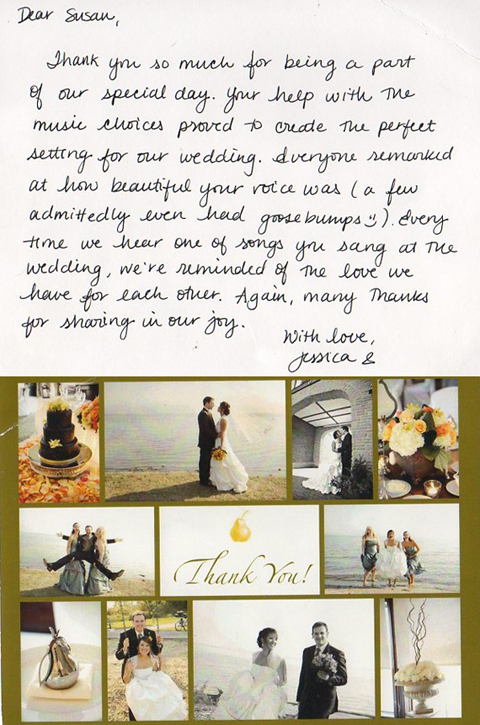 Our guests kept commenting to us for days about how much they enjoyed our wedding ceremony. I feel our service was unique and had an artistic flair. What special memories you’ve helped us make! Just wanted to say Thank You very much for being so flexible and accommodating for our wedding. Your voice is incredible. 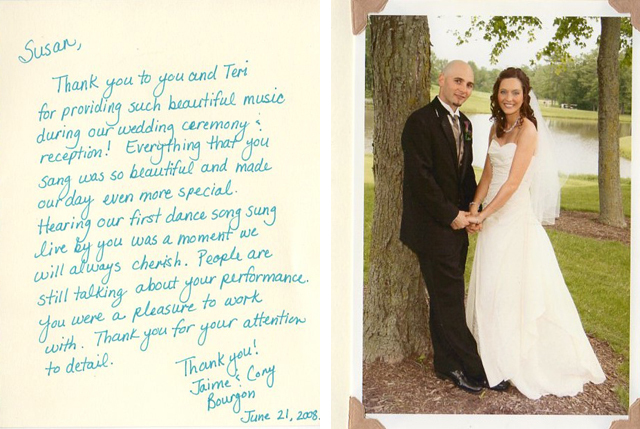 We both had tears in our eyes as I walked down the aisle and having you sing at our wedding was such an honour. Thank you so much! 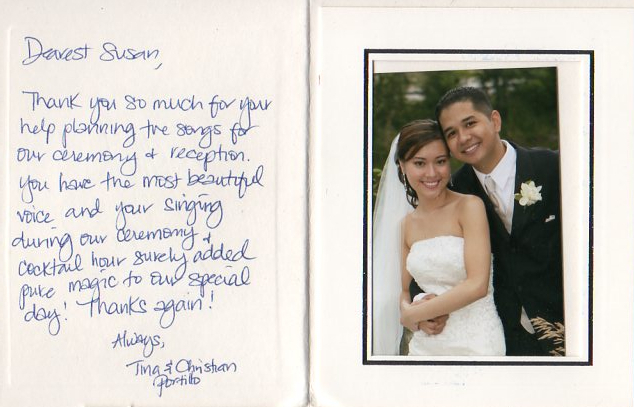 Your singing at our wedding in Oct. 99 was phenomenal! You have a beautiful voice and a radiant smile! We all love your performance and it touched our hearts. A very memorable part of the evening. Thanks a million for sharing your talent with us all! You were superb! 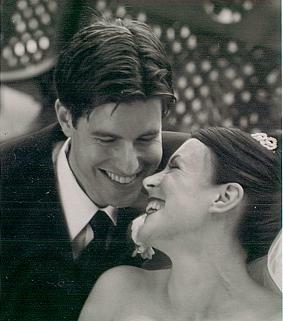 We were so happy with Susan’s vocals and she was so fabulous at our wedding, that I stated publicly that I would sing one day at her wedding. Her voice must have clouded my judgement!!! I hope she doesn’t hold me to that promise! Truly Susan made our day even more special. 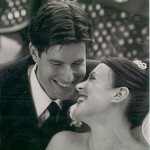 Sue Dunstan sang at our wedding at The Liberty Grand in August 2002. She is truly an unparalleled talent! Her vocals were stunning and sounded like the original artists’ actual CD recordings. 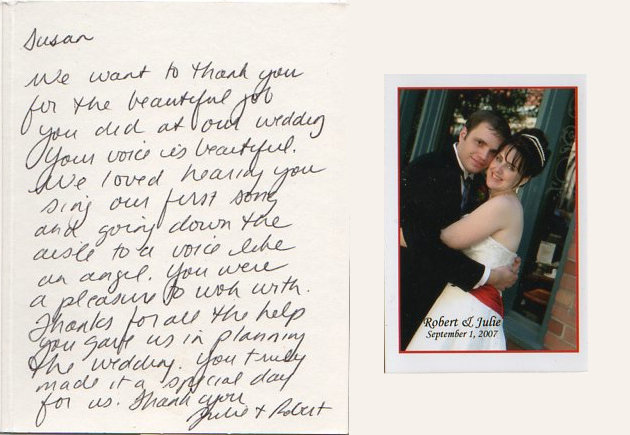 Her knowledge and professionalism in the planning stages of our wedding were invaluable. We would recommend her as a ‘must have’ at your wedding, you will absolutely love her!